My best FM14 tactic ever. Works wonders with both weak and strong teams. No other tactic I tried is better. Let me introduce you to the most successful tactic in Football Manager 2014 that I have created. I truly believe this is the best FM14 tactic ever. I had issues with conceding too much, but as I played I noticed that the computer (AI) switches to 4-4-2 when it falls behind. It seems that 442 is the most consistent tactic in FM 2014. I also learnt that certain things go together; for example, drop deep goes with high tempo and high defensive line goes with lower tempo. If you mix it up you won't get consistent results. So I spent a week working on this 4-4-2 watching full computer vs computer full matches trying to learn the concept, and I think I have finally cracked the code. 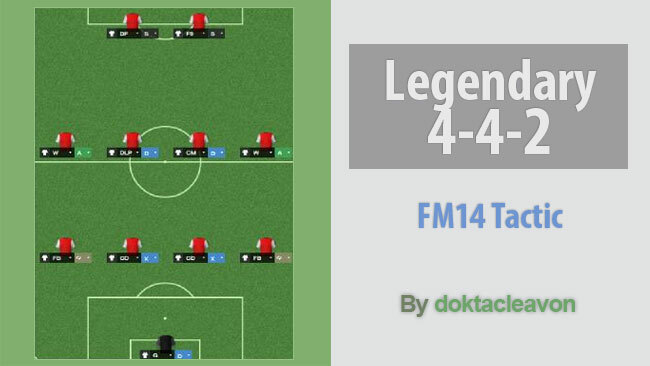 Using this knowledge I created this legendary 4-4-2 tactic you can do wonders with. I tried it with Leeds. I won all the manager of the month awards apart from December. So I got bored and I added a manager and decided to help Racing survive relegation with this legendary 442. WE DEFEATED THE 2ND TEAM (of the league table)!!!! This works great against weaker teams. You'll light them up. It works okay against teams who are equal to you. It is terrible against stronger teams and concedes far too many goals. With this tactic can you still change the player roles about to suit your current players capabilities? Hey, I've just taken over Burnley in my third season and I think I'm going to try this tactic. Do you change to Counter or Balanced etc when playing away from home or against stronger opposition? Thanks and I'll post my results when I get some! I have tested this tactic now on my save with BX Brussels. The tactic is really good, my team is predicted to be 14th in the Belgium Pro League but right now I am 3rd after 13 matches with 27 points 8 wins, 3 draws and 2 loss. What I dont like about the tactic is that when you get a corner your player passes it. I dont like it becuase when they do it I always lose the ball, and its really easy to score on corners on FM14 I have noticed. @aretikz: The author didn't provide a screenshot, so I used a common 4-4-2 formation for the picture. If someone shares a screenshot of the actual tactic I'll update it. why the pic is diffrent from the tactic itself? testing with Falkirk in scotland.. =) What training did u use?? The 4-4-2 is a classic! It leaves nowhere short of players, plus having two strikers puts more pressure on the defense of the other side. I use 4-4-2 with TNS in the Welsh Premier League, and in 2018-19 season with them, qualified for EC/ECC all but 2 times in the 6 seasons, can't go wrong with a 4-4-2! Handcrafted in Symi, Hellas. Page created in 0.569 seconds.